As one of Singapore’s leading Early Childhood Education institute, we provide a range of accredited Certificate and Diploma programmes in both English and Mandarin that prepare educators for vibrant careers in Early Childhood Care and Education (ECCE). We focus on igniting the passion and deepening the knowledge and skills of early childhood education professionals. Our certificate and diploma programmes extend beyond conventional approaches. Through contemporary pedagogies, we combine theory and practical experiences in a truly global setting, allowing our students to be immersed in best practices from around the world. 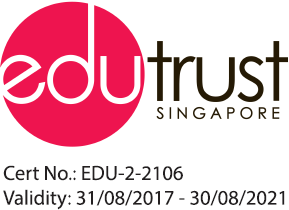 The Early Childhood Development Agency (ECDA) an autonomous agency jointly seen by Ministry of Education (MOE) and the Ministry of Social and Family Development (MSF), through their Preschool Qualification Accreditation Committee (PQAC) and Early Years Qualification Academic Qualification Committee (EYQAC) in Singapore, accredit our teacher education courses. All our teacher education courses are developed according to Skills Framework for Early Childhood Care and Education, a key initiative under Skills Future Singapore (SSG) and Workforce Singapore (WSG). A key feature of Skills Framework is the recognition of prior learning and competencies attained on-the-job. Funding support will be provided to every individual (Singaporean and PR) who is interested in joining the ECCE sector, or currently in the sector. Our programmes are delivered either through face-to-face class sessions or a combination of both or hybrid modes to enhance student’s learning experience. Class sessions are scheduled almost on a daily basis (depending on the programme or module) either in the day or in evenings to suit learners from different backgrounds. These sessions are designed around interactive learning activities and students are assessed through a variety of methods including, among others, role-play, presentations, group discussions or project work to demonstrate their learning. Our exclusive partnership with four of Singapore’s leading brands in early childhood education – Brighton Montessori; Learning Vision; Odyssey, The Global Preschool; and Pat’s Schoolhouse – provides our students invaluable exposure to industry best practices and leading edge pedagogies. To enrich our learners’ experience, we support our students with relevant practicum placements, career counselling and job placements. Your learning success and experience are our priorities. We strive for continuous improvement and excellence to ensure that you receive the best from us. We regularly engage our students for feedback to ensure that our programmes remain current and relevant. A dedicated team of full-time and adjunct faculty members with excellent academic backgrounds as well as in-depth industry experiences delivers our programmes. Our faculty members go beyond teaching; they act as coaches and mentors to help our learners realise their full potential. At AIC, we are ever ready to help prepare our graduating students for the workforce. We organise activities such as career fairs and provide job referral services, which aim to match graduates with prospective employers.